JMT Gear is in the final days of a Kickstarter campaign for a reproduction of the first pattern NASA-issued Gemini- and Apollo-era astronaut flight jackets. Already in production is the very first model "Flite Wear" flight jacket worn by astronauts through the Gemini and Apollo Programs. Based loosely off the 1950s L-2B flight jacket, the original jackets were made in small batches in off the shelf sizes. Each batch is noticeably different in minor aspects: Fabrics, color, zippers, Pattern cut, and snap finishes. There is roughly 5 variations of the "blue jackets" made during the early years of NASA with the earliest ones made by a small tailor shop in Kansas who originally supplied them in Olive Drab to local Boeing test pilots. The first pattern jackets have never before been reproduced by any company until now. The campaign has already achieved its $5,000 goal, so the jackets will be produced. The jackets, available in sizes XS through 2XL, are priced at $175 each. Interesting, seems a pretty good compromise between price and authenticity. I think the "Still The Right Stuff" versions are better (and yes, they did make a first batch version, but not for general sale). This is a lot easier on the wallet though. I was happy to support this project, and look forward to what they will be offering in the future on their website. I do wish they could give some general guidlines for sizing, though. They may end up with alot of returns for this reason. I agree with the aforementioned comparisons to the Still The Right Stuff product, but when I saw Al Worden at KSC a few months ago, I asked him about them being offered again. He said he wasn't sure, and repeated what was on the website previously...that they were still looking for another supplier. At this price, it's tough to pass up the opportunity should they become hard to find once again. Regarding the sizing of these, a chart is included in the updates section of the Kickstarter site. The price makes them tempting although the chest sizes seem very big for flight jackets that are apparently based on military patterns. As an example they state large has an armpit to armpit of 27." Thanks for that. If anyone else is looking for the size chart click on the Campaign link on the Kickstarter page and scroll to the bottom. $175 doesn't look like a bad price and it looks pretty good from what I see there. ...although the chest sizes seem very big for flight jackets that are apparently based on military patterns. I wondered about that, I think I'll just go with size names. The chest measurements seem well out. Perhaps an error? Maybe not though, seems to be falling off the shoulders of their model. These jackets are meant to be large in the chest, so the best unit of measure is sleeve length and jacket length. We based our patterns and sizing off early 60's L2B flight jackets just like the originals. ...this jacket will generally fit the same as an L-2B jacket. Their quoted chest measurements seem at odds with my early '60s L-2B at any rate. Just noticed an update stating that sleeve length is taken from the armpit. Surely that can't be right. Large size sleeve length quoted as 25". Sounds very wrong to me, hope I won't have to return mine - if that's even possible. I'd really like to purchase one of these, but the sizing chart really has me wondering. I normally wear a Large (42" chest). However, according to their sizing chart, a large would be a barrel-like 54". Using the chart measurements, even a Small would be too big. The arms lengths are similarly out of proportion. I sent an email to jayhawk, and am hopeful to get a reply soon. There is still a lot of confusion on sizing. We've discovered that that is absolutely our fault and we want to apologize. Our manufacturer is measuring differently than the military specs we've used. SO, when measuring your sleeve length, stand with your arm extended straight out to your side like the image of the man below in just a T-shirt. Measure from the middle of the back of the neck, down the arm, to the wrist. I apologize again. The biggest confusion has been on our part. Sleeve length IS the best thing to go off of and I hope this helps clear up any sizing issues. 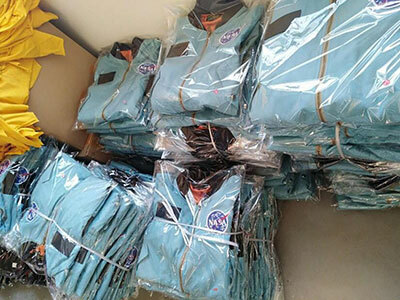 Has anyone received their jacket/s yet? Not yet. All gone very quiet. Has anyone seen or heard anything? ...for the jackets and all of our wonderful customers, after all the delays and hiccups, we finally have a fairly solid delivery date scheduled for next week to our shop. As soon as they're in I will be posting another update. Once they are here, It will take several days to do our own personal QC checks and get everyone's orders bundled up and out to the post office. So we're not too far off from getting them out the door to you now. As a show of appreciation to all backers and customers who have been so patient with us, we will be including a 50% off coupon code off any future orders. To anyone who wants a refund, I completely understand, please message us and I will get back with you as soon as possible and get that arranged. Again I apologize for our for unprofessional lack of communication. We are trying everything in our power right now to correct it and regain your confidence in us. In closing with this update, I'm attaching a photo from our contractor from just prior to boxing up the last of the jackets and being shipped to us. We promise they do exist, are on the way, and we're doing everything we can to get them to you as soon as possible. I cannot even begin to describe how disgusted I am with JMT and their Kickstarter campaign. I "bought" one of these jackets, and got billed for two of them. Kickstarter blamed "the creator," and "the creator" blamed Kickstarter. Regardless of whether it was one or two jackets, I haven't received anything - either the jackets or a refund, or even the courtesy of a reply to my inquiries. I tried contacting JMT repeatedly, with no response. So, it looks like I'm out around $400. This will be my last Kickstarter adventure. And to anyone who is contemplating purchasing one of these jackets, you should think long and hard before you give JMT your money. Since I'm waiting on one of these too (hopefully in the correct size), I rather hope that your disappointment proves to be premature. Glad I already have the "Still The Right Stuff" version. Steven was a pleasure to deal with. I "bought" one of these jackets, and got billed for two of them. Is it possible to start a chargeback with your card issuer? It also strikes me odd that KS is washing their hands of the issue, especially since it is their system which processes the payments/orders. Even better, it turns out that 9% of funded Kickstarter campaigns leave their backers high and dry. Kickstarter, by their own admission, is perfectly fine with 9% of their customers being ripped off, “We think that 9% is a reasonable failure rate..."
If you can’t wait any further or don't like what we have to say and want a refund, please send us an Email with the title "Refund Request" to jayhawkmilitarytextiles@gmail.com. We will begin to process these requests at the end of the month. January 10th update: email to request a refund have gone unanswered, and refunds have not been received.